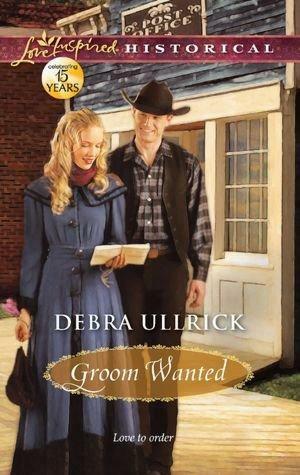 Laughing with tears in your eyes is what you’ll be doing when you read “Groom Wanted” by Debra Ullrick as Leah and Jake look for spouses in all the wrong places. Sometimes the things that are right in front of our eyes are the hardest to see. I enjoyed this book immensely. Ms. Ullrick’s writing pulled me in and held me until I found out Leah and Jake’s happily-ever-after. It’s a perfect plan-best friends Leah Bowen and Jake Lure will each advertise for mail-order spouses in the papers, and then Jake will help select Leah’s future husband, while Leah picks Jake’s bride-to-be Surely the ads will find them what they seek: a wife who’ll appreciate Jake’s shy charm and a groom who’ll take Leah away from the Idaho Territory she detests. When the responses to the postings pour in, it seems all Leah’s and Jake’s dreams will soon come true. But the closer they each get to the altar, the less appealing marrying a stranger becomes. Is it too late to turn back- or to turn around and find the happiness they truly seek together, at last? Your blog is beautiful, Ginger!